Stand around the first tee on any given Saturday morning and several things are obvious. For the purposes of this article the one that concerns us is the lack of turn most males (and a lot of females) have in their backswing. If the idea is to pivot without swaying so your back is towards the target while not collapsing your arms, most of us haven’t got it. Ask any instructor. With a proper backswing hitting the ball effectively becomes more than likely…without it, luck enters into the result a lot more than we want. So with that all in mind I agreed to test the MSIG device which I first saw at the PGA Merchandise Show last January. Most of us, including myself, could be more flexible. And since flexibility is a requisite to a proper swing if we want to improve, get more distance, achieve more consistency and walk off with the pretty girl we have to do something. Enter the MISIG from the fertile mind of inventor Bernie Fay who was looking for a way of stretching and strengthening his shoulders to offset the aches and pains of aging so he could enjoy playing golf more. After trial and error he came up with a simple device that he found not only helps to “limber up” prior to a round but since the device almost “forces” the MISIG shaft into the proper position, repetition goes a long way to teaching a correct backswing plane. 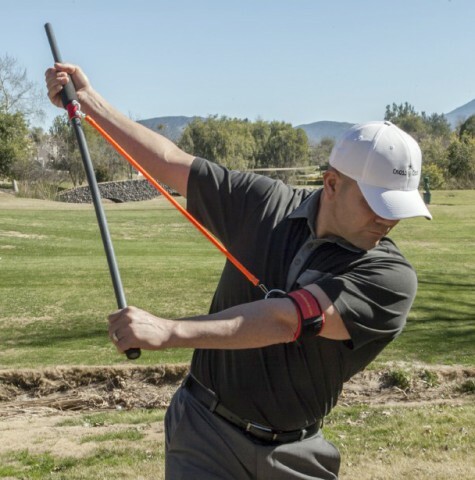 Out of the box the MISIG is easy to assemble then just wrap the Velcro closure cuff around the lead arm above the elbow, grab the sliding grip with the trailing hand and make a backswing. What I felt immediately was a tremendous stretching of the back muscles and lead forearm but something else just as important. When I turned my shoulders 90 degrees the MISIG shaft was exactly on plane, i.e., pointing parallel to the target line. I am now using the MISIG as part of my exercise program and though I can’t say it’s increased by drives by 30 yards I can make a much freer turn. MISIG, which stands for “Most Important Stretch In Golf,” retails for $79.99 online at feelthestretch.com. It comes with three stretch cords (light, medium, strong), the shaft with sliding grip and arm cuff. And, oh yeah…I lied about the pretty girl.